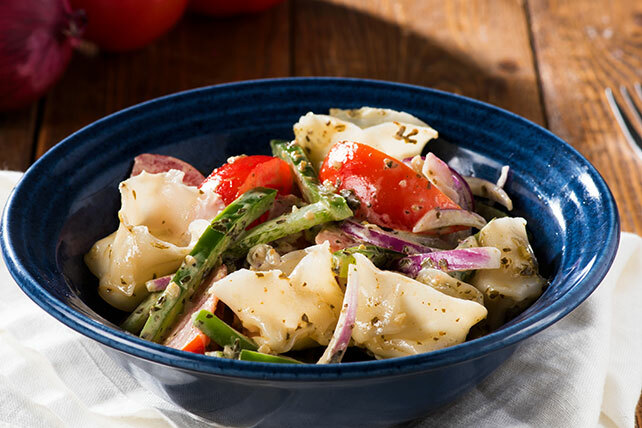 The refrigerated cheese tortellini gives this easy-to-make pasta recipe a major head start in the race to pasta salad greatness. It finishes with veggies and pesto for the win. Cook pasta as directed on package; drain. Rinse with cold water; drain well. Place in large bowl. Serve with grilled chicken and a fresh fruit salad. Store bell peppers in a plastic bag in the refrigerator for up to 1 week. Sprinkle with 2 Tbsp. KRAFT Shredded Parmesan Cheese before serving.